Chomp, an app search engine, has partnered with Verizon Wireless to offer an app search engine for the communications company’s mobile app marketplace, V Cast. Chomp, which just launched an Android app that allows users to search across Google’s Android Marketplace, now allows customers to search for apps on the V Cast marketplace. Chomp now allows Verizon Wireless customers to find apps based on what the app does, as well as the title or name of the app. 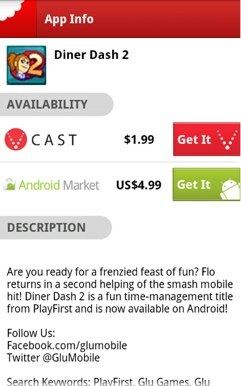 Verizon Wireless customers with V CAST apps enabled devices can download Chomp (which is free) from the marketplace. But additionally, with the integration with Verizon, Chomp allows users to search for apps across multiple storefronts, including Google’s Android Market. When the same apps (in different marketplaces) are priced at different points, Chomp will show the least expensive shown first. Chomp CEO Ben Keighran says that cross-store search is a ‘milestone’ for the app and for the greater landscape of Android apps. With the Google Android Marketplace, Amazon’s Android App Store, and other independent App Stores like Appia’s white-label offerings, there’s a need for cross-platform search. Chomp hopes to be the solution to this problem. Keighran’s vision for Chomp is to provide users with the ability search across app stores and marketplaces. Next on the list for Chomp should be Amazon’s Android App Store.